The Rock has debuted some awesome vintage-style posters for his upcoming movie Skyscraper. The wrestler-turned-actor has not been shy in declaring that this particular blockbuster, though not based on anything specific, was directly inspired by a couple of classic action thrillers; 1988's Die Hard and 1974's The Towering Inferno. In order to pay homage to those movies, Dwayne Johnson has debuted a pair of new posters that directly channel those classics. 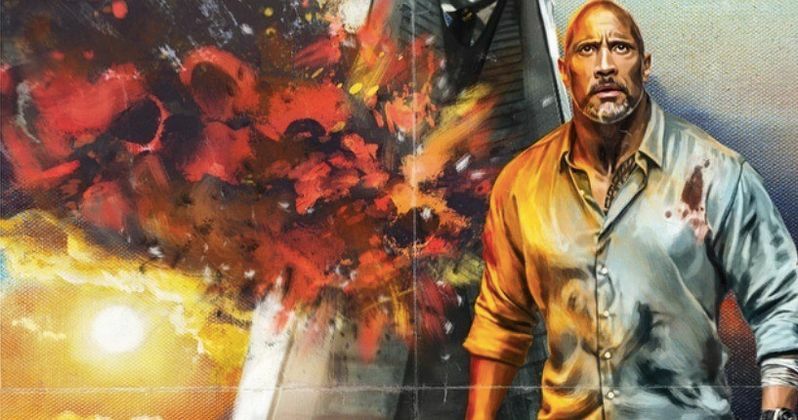 Taking to social media, Dwayne Johnson shared the pair of posters, just ahead of the debut of the final trailer for Skyscraper. According to his caption, it sounds like these posters were actually his idea and he's not shy about declaring his love and respect for Bruce Willis, Steve McQueen and Paul Newman. Here's what he had to say about the posters. "I had these ultra cool vintage posters made paying homage to the two classic movies that inspired me and generations, and became the inspiration for my film Skyscraper. Respect & luv to the GOAT's Willis, McQueen & Newman #DieHard #ToweringInferno #Skyscraper"
In a follow-up tweet The Rock added, "Bruce was a big influence on me." The posters themselves work as excellent homages to their respective movies. The one channeling Die Hard looks very much like the theatrical poster for the action classic that helped make Bruce Willis a movie star. The one inspired by The Towering Inferno looks like it was ripped straight from the 70s. At the present time, it isn't clear if these posters are just going to be making the rounds online or if they're actually going to be displayed to help market Skyscraper. If this movie is as good as it looks like it could be fans may want to get their hands on one, or both, of these for themselves. Skyscraper reunites Dwayne Johnson with Central Intelligence director Rawson Marshall Thurber, who wrote the screenplay in addition to directing. The pair have already lined up their next project, Red Notice, which will star Gal Gadot and is slated for 2020. In addition to Johnson, the Skyscraper cast includes Neve Campbell, Chin Han, Roland Moller, Pablo Schreiber, Byron Mann, Hannah Quinlivan, Noah Taylor, Jason Day, Byron Lawson, and Elfina Luk. Critics have yet to weigh in, but the trailers have delivered on the action and this could serve as the perfect break for those who are looking for something a little more fresh. This summer has been a good one for the box office, but it's relied heavily on sequels and the usual superhero offerings, as is common these days. But Skyscraper is one of the only blockbusters arriving this summer that isn't based on anything recognizable. It's a big, original action flick that is banking on a major movie star in the form of Dwayne Johnson. Much like the movies that inspired it, Skyscraper feels old school in that way. Let's hope it lives up when it arrives in theaters on July 13. You can check out the new posters, courtesy of The Rock's Twitter account, for yourself below. Bruce was a big influence on me. Die Hard (and Towering Inferno) were the inspirations for SKYSCRAPER. Paying homage to those films.